Some say the greatest actress never to win an Oscar. 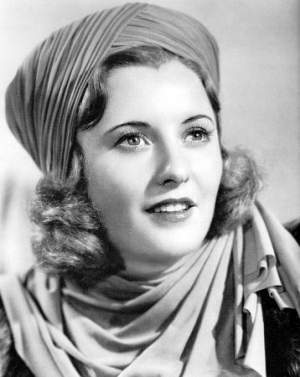 Barbara Stanwyck was nominated as Best Actress four times, but didn't take a statuette home until the Academy presented her with an Honorary Award at the 1981 ceremony. The portrait at left is as Margot Weston in ALWAYS GOODBYE (1938). 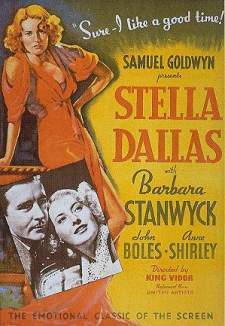 A poster from STELLA DALLAS (1937), a melodrama about a mother determined to give her daughter everything, for which Stanwyck earned her first Oscar nomination. "Did you never know that flirtin' gets into a woman's blood just like fightin' gets into a man's?" --as Mollie Monahan in UNION PACIFIC (1939). "They say a moonlit deck is a woman's business office." --as Jean Harrington in THE LADY EVE (1941). "You see, Hopsy. You don't know very much about girls. The good ones probably aren't as good as you think they are, and the bad ones aren't as bad... not nearly as bad." --as Jean Harrington in THE LADY EVE (1941). "If you waited for a man to propose to you of natural causes, you'd die of old maidenhood." --as Jean Harrington in THE LADY EVE (1941). "I need him like the ax needs the turkey." --as Jean Harrington in THE LADY EVE (1941). "A little sun on my hair and you had to water your neck." --as Miss O'Shea in BALL OF FIRE (1941). "The things a girl will do for a mink coat." --as Elizabeth Lane in CHRISTMAS IN CONNECTICUT (1945). "Some people say, 'Yes.' Some people say, 'No.' I'm inclined to agree with them." --as Elizabeth Lane in CHRISTMAS IN CONNECTICUT (1945). "Every time I opened my mouth, he talked. I felt like Charlie McCarthy." --as Elizabeth Lane in CHRISTMAS IN CONNECTICUT (1945). "John, when you're kissing me, don't talk about plumbing." --as Elizabeth Lane in CHRISTMAS IN CONNECTICUT (1945). "It is difficult for anyone to speak when you listen only to yourself." --as Lorna Bounty in THE MAN WITH A CLOAK (1951). 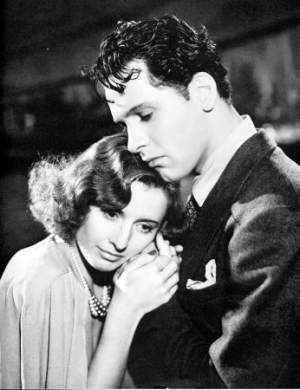 A still from GOLDEN BOY (1939), a boxing film also featuring William Holden (with Stanwyck at right), Adolphe Menjou and an Oscar-nominated score by Victor Young. 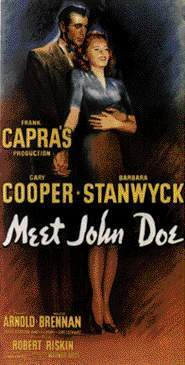 A poster from Frank Capra's MEET JOHN DOE (1941) starring Stanwyck as newspaper reporter Ann Mitchell and Gary Cooper as Long John Willoughby (a.k.a. "John Doe"). This film was nominated for a Best Writing/ Original Story Oscar and also featured Edward Arnold, Walter Brennan, James Gleason, Gene Lockhart and a musical score by Dimitri Tiomkin.